This 7ft x 4ft Waltons Metal Garden Shed is a fantastic addition to any garden where space is tight but you require outdoor storage. 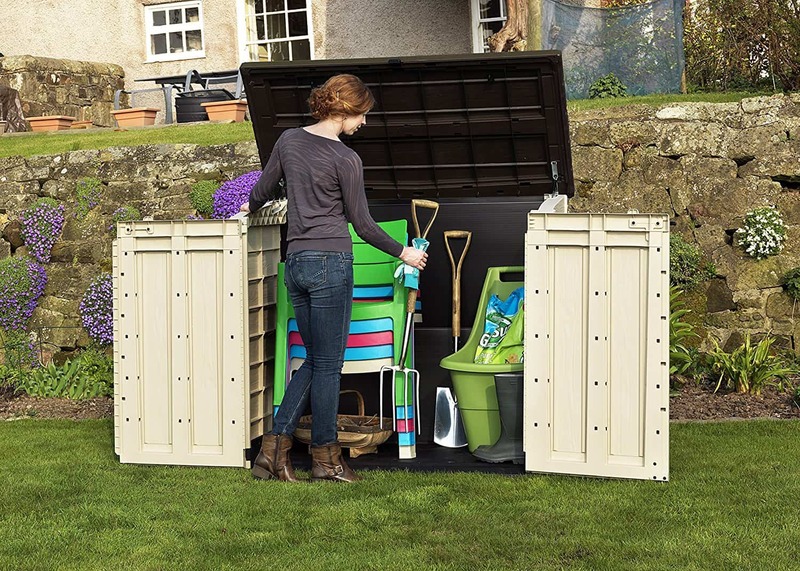 Whilst the shed is only 7ft x 4ft in size, which some would see as a negative it is still plenty big enough to store garden tools, lawnmower, hosepipes etc. The length isn’t actually that small at all, it’s just lacking a little in the depth department. Walton’s do offer different variations of this shed including one at a whopping 9ft x 6ft. 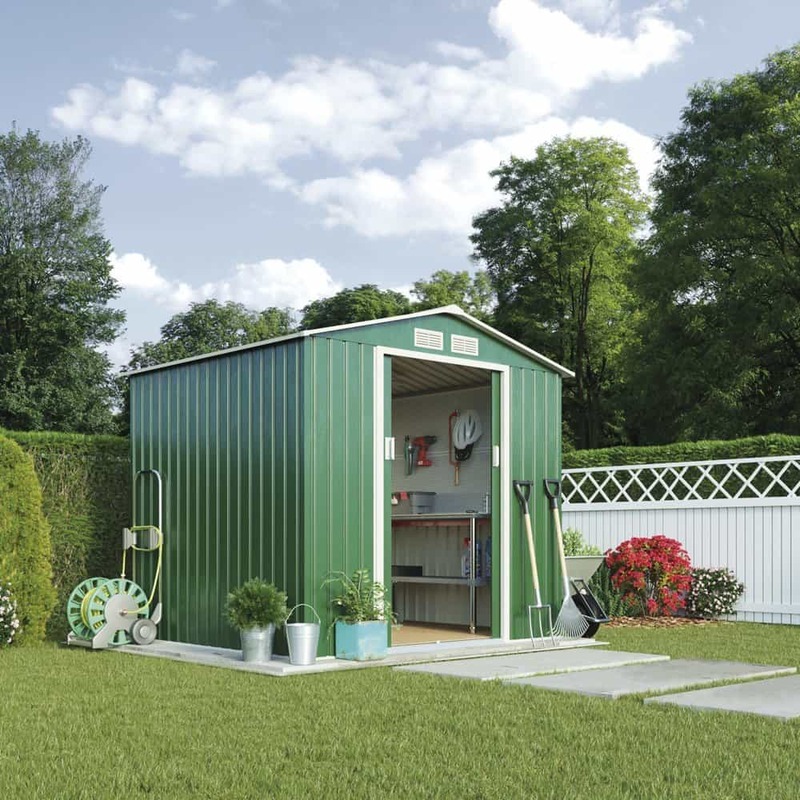 You can find the 9ft x 6ft Metal Apex Roof Outdoor Garden Storage Shed here. This Waltons 7ft x 4ft metal apex roof outdoor garden storage shed has a sturdy metal construction, is maintenance free thanks to the powder coated, galvanised panels, blends into your garden and keeps the rain out thanks to it’s apex roof! This metal apex roof shed from Walton’s is one of there more budget range and when it comes to metal sheds it can be sometimes worth investing a little more money. Thats not to say that this 7ft x 4ft metal shed is flimsy or not robust when built. Quite to the contrary, once you have finished assembling the Walton’s metal apex garden shed you will again see the Walton’s level of quality! It is a well built construction if you follow the handy user guide that comes with it and will stand up to our legendary wobble test no problem. Personally we prefer wooden garden sheds to metal ones, but metal ones definitely have their place. They are much less maintenance, can look much better aesthetically straight out of the box as they are usually a green or beige colour​. Plus we feel they are a good security measure as breaking into a metal shed will make one hell of a racket and likely wake you up. This Walton’s 7ft x 4ft metal apex garden shed ticks a fair few of these boxes very well. The structure and build quality of the shed feels robust and solid. 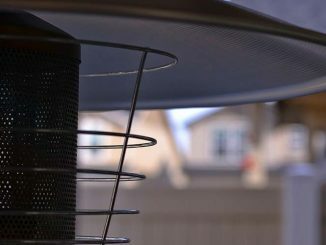 It’s apex roof keeps our things from getting wet, the vents help prevent condensation and the metal design helps with the overall security and integrity of the garden shed. One big advantage, from a security point of view we see with metal sheds is it’s lack of windows! 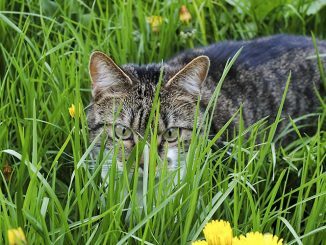 The advantage is nosy neighbours can’t have a quick peak at the contents of your garden shed. Potential burglars can’t do window shopping and don’ have a window that they could pop out or smash to gain entry. A negative with this metal apex garden shed is the lack of a floor. This means you either need to provide your own, or build a base from something such as paving slabs. 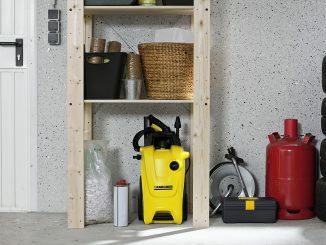 There are anchoring points within the shed and it does come with a free anchoring kit. Obviously there would be little point anchoring on grass so please consider a solid standing to anchor to. Walton’s are known for quality, durability and standing by their products, something which they are very proud of. There wooden sheds come with an outstanding 10 year guarantee, thats how confident they are. So why oh why have they given it a ridiculous 1 year warranty? We have found us asking ourselves this, kicking the shed, blasting it with water, kicking it again, re-doing our trusty wobble test. Still we are sat scratching our heads! It is a great little shed and we wish they would give a little more confidence ​to the consumer by providing a longer warranty. Whether you are building a metal or wooden shed or garden building you need to plan, prepare, allow plenty of time and be patient. The assembly of a metal shed is a little different to that of a flat pack wooden shed. 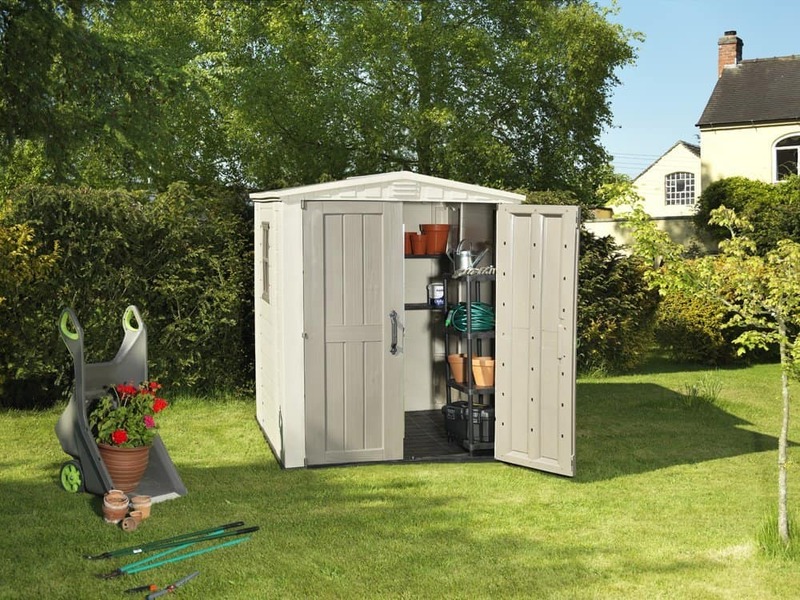 This Walton’s 7ft x 4ft metal apex garden shed ​is no exception! They tend to come with more components and many more screws. This can look a little overwhelming at first but once you understand how they go together it isn’t daunting at all. Firstly check all of the parts are there, make sure your electric screw driver or impact driver is charged, have a quick overall read through of the instructions, grab a friend, some snacks and drinks and let the big build commence. The instructions with this 7ft x 4ft metal apex garden shed are clear and concise. They can be easily interpreted if you are patient and sit back to look at them, if you are balanced on a ladder with screws in your teeth, a panel in one hand and an impact wrench in the other they will appear to be in a different language. Depending on your level of DIY competence we recommend setting aside around 5-6 hours for this build​. This could be faster could be longer, it is all dependant on your experience level and how fast you work. The images we have used in this review are in fact of of the 7ft x 6.3ft model so please make sure you measure out the shed using the above dimensions when working out how it will look. We always ask that you check with the manufacturers or retail outlet you are purchasing from to double check dimensions as these can be subject to change on the model you are purchasing. 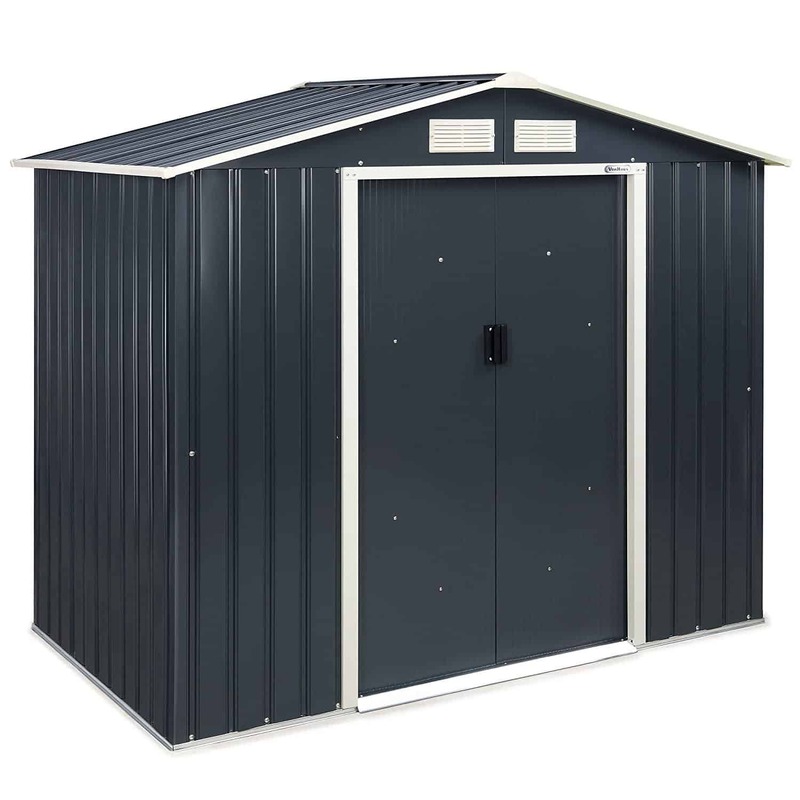 The Walton’s 7ft x 4ft Metal Apex Roof Outdoor Garden Storage Shed is a great budget metal shed! Metal sheds vs Wooden Shed is a preference thing. Some love the look, structure and security elements of a metal shed. Other prefer the more traditional wooden shed and feel they are in fact more secure. 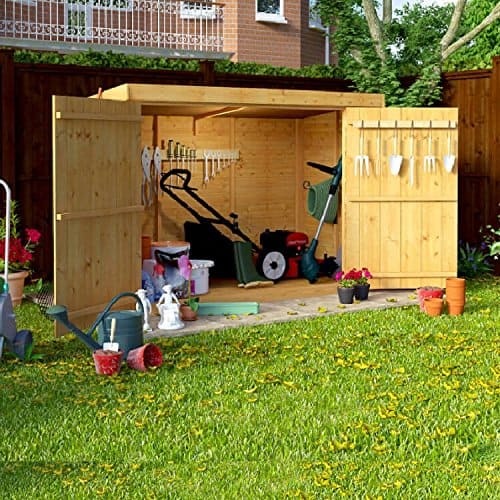 All in all we feel this shed is fantastic and a great addition to your garden if space is tight and you just need some outdoor storage. 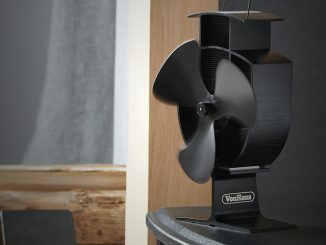 The only thing that lets it down is the measly 12 month warranty offered by Walton’s.